Colour-blocked workspaces are implemented over historic details at the offices for a software company in Montreal, by local firm ACDF Architecture. Canadian software company Lightspeed commissioned ACDF Architecture – which designed the first phase of its headquarters – to complete an additional workspace on the ground floor of the 19th-century former Viger Railway Station hotel. "With its distinctive architecture and its historical significance, the building is an iconic landmark that stands out in Old Montreal's skyline," said a project description from ACDF. Dedicated to product development, the office spans 1,200 square feet (1,040 square metres) and features exposed brick walls, 15-foot-high (4.5-metre) ceilings and plenty of windows. 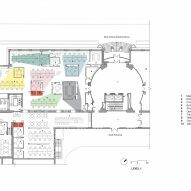 ACDF opted for an intervention that preserved the building's rich heritage and original details, while adding colourful elements and glossy white floors. "The architects uncovered remaining bricks and stones to expose the raw material, and created a dynamic contrast between old rough walls and new rectilinear geometry that highlights the space's qualities," said the description. Remnants of the building's shell offer a backdrop to the contemporary elements in the space, which is organised around a set of individual workspaces. Based on the work styles of Lightspeed's employees, a series of areas – each a different pastel shade – allow teams to collaborate as units. Coloured pink, blue, yellow and green, these areas contain open work spaces, a meeting room and a social area. "Like small islands, these areas form a dynamic archipelago that invites gatherings to take place in the in-between space," said ACDF. The varying pastel tones cover walls and floors as glossy shadow-like shapes, defining the zones. The coloured walls also double as whiteboards for meetings and presentations. Dividing the spacious floor plan are four columns, each also painted a different colour and integrated into the team areas. Phone booths are painted red, evocative of Britain's red telephone boxes, while a large conference room is decorated in dark grey. An old central brick wall characterises a common area or "alley", which also features a glossy floor finish, exposed original concrete and terrazzo patterns. "The central position of the alley divides the floor in two: a clean and edgy space on one side, an industrial environment on the other," ACDF said. "Located at the junction between the 1898 Viger Railway Station and the 1912 Berri Railway Station, the alley is a space where eras and people meet." Similar to the offices for Lightspeed, ACDF also opted for a colourful palette for the Montreal headquarters of Playster. The Lightspeed 2 office is shortlisted in the workplace interior category of Dezeen Awards 2018. Winners will be announced 28 November 2018, during a ceremony in London.